The palm oil sector was the single largest driver of deforestation in Indonesia between 2009 and 2011, accounting for about a quarter of the country’s forest loss, Greenpeace International has revealed in a new report, ‘Certifying Destruction’. According to official Ministry of Forestry maps, Indonesia lost some 1.24 million hectares of forest between 2009 and 2011. Greenpeace states that identified palm oil concessions accounted for about 300,000 hectares of this loss. 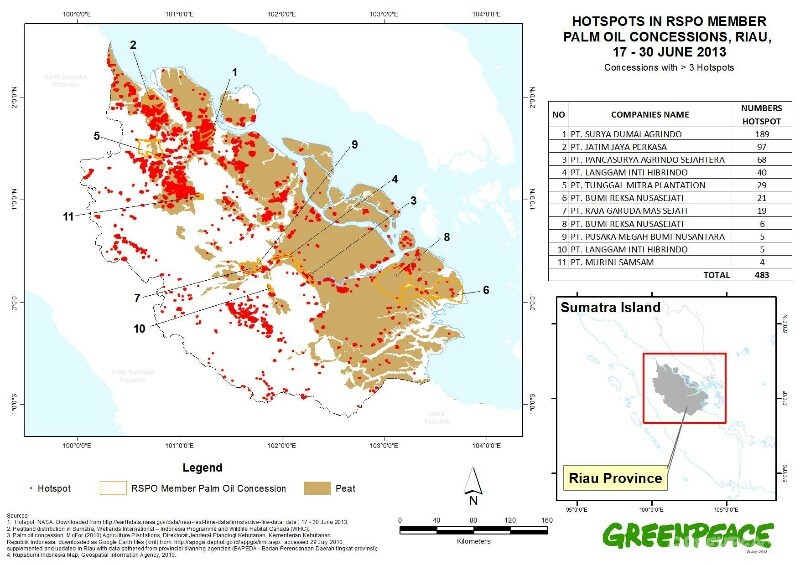 The new mapping analysis by Greenpeace indicates significant deforestation in concessions owned by members of the Roundtable on Sustainable Palm Oil (RSPO). Fifty percent of the deforestation took place in just three provinces: Central Kalimantan on the island of Borneo (24 percent), Riau province on the island of Sumatra (19 percent), and West Kalimantan, also on Borneo (8 percent). In West Kalimantan, 75 percent of forest loss was due to palm oil cultivation, in East Kalimantan the figure was 55 percent, and in Central Kalimantan it was 38 percent. 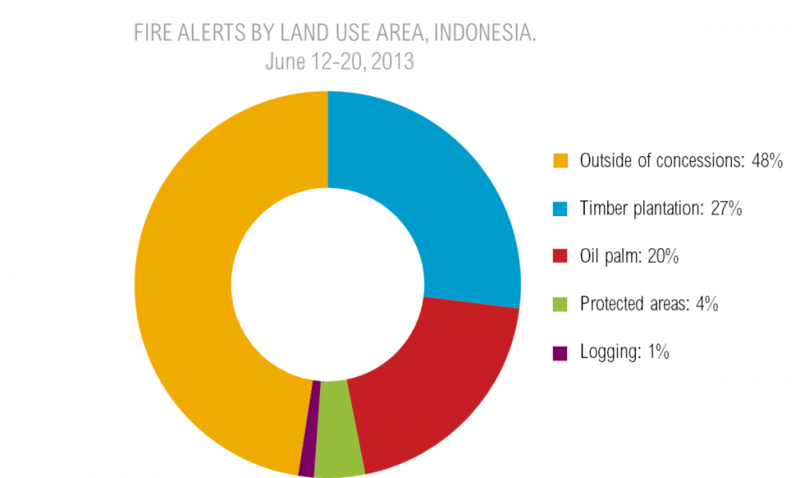 Greenpeace and the RSPO have been at loggerheads over who is to blame for fires in Riau province in June this year, and what action should be taken. 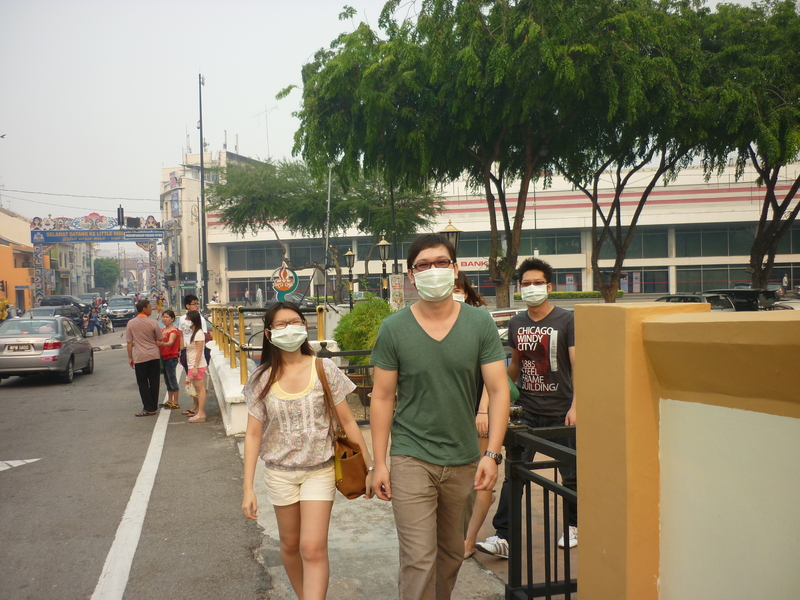 The fires caused a choking haze of pollution to spread across western Malaysia and Singapore, and led to states of emergency being declared in the worst affected districts in Sumatra and in towns in the Malaysian state of Johor. “The RSPO wants its members to be industry leaders in sustainability, but its current standards leave them free to destroy forests and drain peatland,” said Bustar Maitar, head of Greenpeace International’s Indonesia Forest Campaign. 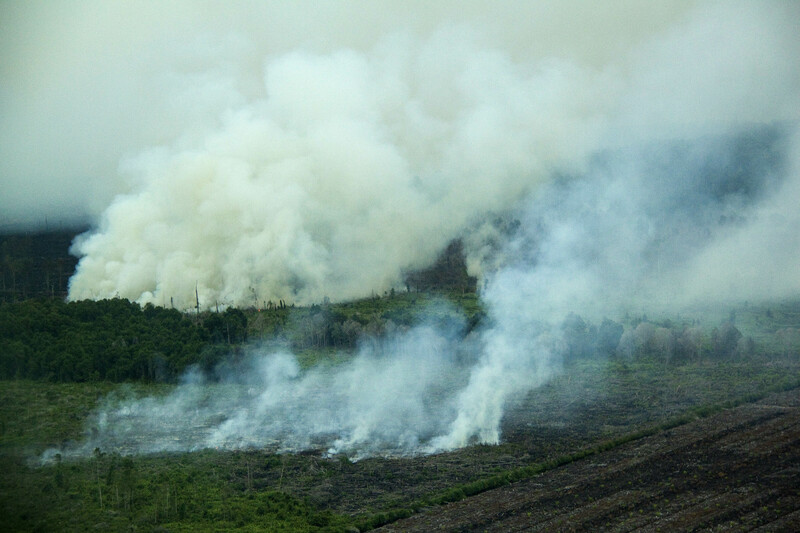 The US-based World Resources Institute said initial data showed that half of the fires in Riau in June were burning on timber and oil palm plantations, but palm oil and pulp and paper companies rejected accusations they were responsible for fires in or around their concessions. The RSPO says it quickly investigated members against whom complaints were made, and is formally examining the case against PT Jatim Jaya Perkasa, a Ganda Group company. It accuses Greenpeace of using incorrect reference maps in its analysis. The new Greenpeace report states that, in 2009, RSPO-affiliated concessions accounted for a disproportionate 21 percent of deforestation in oil palm concessions – 63,000 hectares, including nearly 20,000 hectares of carbon-rich forested peatland. Greenpeace cites the Malaysian multinational Genting, Surya Dumai, and Wilmar International as the three privately-owned RSPO members with the largest areas of identified deforestation. A handful of traders, including Singapore-based Wilmar International – the world’s largest palm oil trader – control much of the palm oil trade from Indonesia. There are now estimated to be 10.8 million hectares of oil palm plantations in the country, and the mature area under harvest is estimated to cover 8.1 million hectares. 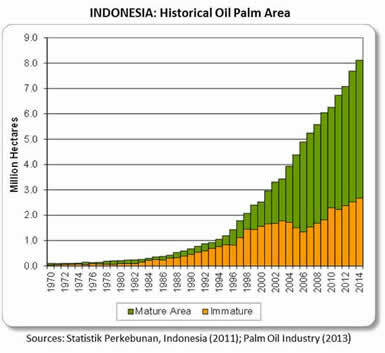 The United States Department of Agriculture forecasts 2013/14 palm oil production in Indonesia to hit a record 31 million tonnes, up 2.5 million or 9 percent on the previous year. According to Greenpeace, most of the palm oil the traders are selling is “dirty oil”. Oil originating from forest destruction is being blended in their refineries. “The mechanisms by which RSPO palm oil is traded offer virtually no supply chain traceability. With very limited exception, palm oil coming from deforestation and destructive operations is mixed with palm oil from certified operations. “Producers can be RSPO members without having any certified concessions. RSPO members can freely trade fresh fruit bunches (FFB) and oil produced by non-members who have made no sustainability commitments. “Some of the most prominent RSPO processor members, including Wilmar and Musim Mas, are heavily dependent on sourcing and trading FFB or palm oil products from third-party suppliers. FFB from unlicensed plantations and areas cleared by fire can end up in mills belonging to RSPO members. Wilmar International stated in July that it would terminate its business relationship with any suppliers found to be flouting the law against forest burning. “It is not yet clear what actions Wilmar is taking to investigate suppliers’ links with the fires, or whether any contracts have been terminated, including with PT Jatim Jaya Perkasa,” Greenpeace said. To buy genuinely certified palm oil, end-users must trade through the segregated supply chain, and there are currently very few sales through these routes. “Even among the RSPO’s own members, dirty palm oil remains the common currency – RSPO standards are inadequate, poorly enforced, and offer palm oil consumers no guarantee that the oil they buy has been produced responsibly,” Greenpeace states in its report. RSPO members are supposed to ensure that forests are assessed for high conservation value (HCV) before new plantings, and to take areas with high carbon stock into account. However, RSPO certification allows ongoing clearance of any forest not identified as primary or HCV. “Much of the remaining rainforest available to the industry in Kalimantan and Sumatra is secondary or degraded and may not be identified as HCV, yet from both a conservation and a climate perspective it is crucial to protect such forest,” Greenpeace said. Since June, Greenpeace has contacted more than 250 palm oil consumer companies, asking them how they ensure that their supply chains are not linked to forest destruction. “Of the replies received so far, it seems that almost all companies rely solely on the RSPO to meet any ‘sustainability’ commitments they may have,” said Greenpeace forest campaigner Areeba Hamid. A new initiative, the Palm Oil Innovation Group (POIG), has been set up by a handful of NGOs and palm oil companies and aims to set additional requirements for the industry. Its goal is to stop deforestation through the conservation of high carbon stock forests, including secondary forest. It wants to see an end to development on peatland and will call on palm oil consumer companies to establish mechanisms to trace the origins of the oil they are buying. Its charter will include rules about reserving sufficient land for local communities’ food crops. RSPO rules allow peatland forests to be cleared for the expansion of plantations, and the palm oil produced from these plantations can still be RSPO-certified. The RSPO sets no limits on greenhouse gas emissions associated with the development of palm oil plantations. This is something the POIG will tackle. Slash-and-burn fires set by palm oil companies have destroyed large swathes of the Tripa peat forest in Aceh, northern Sumatra, an area that is precious habitat for wildlife, including the critically endangered Sumatran orangutan. At least 100 orangutans are believed to have perished in forest clearing and peat burning in 2012, and another 100 are thought to have died between 2009 and 2011, many because of starvation. The international demand for palm oil is massive. According to the WWF, about half the packaged food now found in supermarkets contains palm oil. It is present in all kinds of produce ranging from biscuits and peanut butter to chocolate and ice cream; it’s in all kinds of ready meals and breakfast cereals, and in shampoo, cosmetics, shaving cream, soap, and industrial lubricants.